Last month Ferguson burned. Amidst the images of flames, teargas and blockages, there were as many people with cameras and cell phones as signs or molotovs. Everyone seemed to recognize the significance of these events, but there are many competing interpretations. As fighting and protests continue in the street, debates and hand-wringing about race, protest tactics, and the American police state, have exploded on the internet and in the media. At this moment, all these questions are open in more minds than they have been since the late sixties and early seventies, when the debate was shut down by mainstream media embracing the pacifist / reformist side and government forces exterminating the militant / revolutionary side. The return of massive and increasingly violent protests probably comes from many factors: the overreach of pacifism, the many failures of democracy, socio-economic conditions of increasing futility and desperation. All these things motivate people to get fierce and take to the streets. The parallel resurgence of debates about militancy, police, and race on the other hand is largely due to the hard work of various dedicated radical writers. Among these writers, Kristian Williams stands out as not only uncompromisingly radical, but also thorough, plain spoken and exceptionally reasonable. Williams’ new book, Fire the Cops! put out by Kersplebedeb, seems particularly timely, with its focus on resistance to police. This collection of essays was written between the first and upcoming newest edition of Williams’ seminal work on the history and social role of police, Our Enemies in Blue. In both books, Williams distinguishes himself from many authors, including radicals or leftists, by focusing on the “good” cops. He’ll talk about police terror and brutality for sure, but for Williams, the entire institution of policing is dangerous, illegitimate and in need of much more than reform. He argues that the good cops do as much or more to advance the march of the American police state than the rotten apples. My favorite essay in the collection, The Other Side of COIN explains why. In this essay, which is partially based on his contribution to Life During Wartime, an anthology he co-edited in 2013, Williams delves into the output of the RAND Corporation and various other pro-government institutions to examine the state’s counter-insurgency strategy. There he finds a strong emphasis on propaganda, legitimacy and soft control approaches. The government recognizes that military might does not win these battles so much as savvy politics. Many of the reforms demanded by the left, like community policing and neighborhood liaisons actually advance the state’s needs by increasing and solidifying its perceived legitimacy. “Officer Friendly” is far more capable of winning the hearts and minds of the oppressed in America than Darren Wilson and other killer cops the left-wing critics usually focus on. Williams is also distinct in that he speaks from direct experience of resisting police violence. The first essays in Fire the Cops! were written during protests and anti-police riots in Portland and Oakland. In these essays Williams describes a level of anger and disillusionment in communities targeted by police and a corollary escalation of tactics that seemed to predict the current street battles and struggles to block everything. A friend of mine once dismissed Kristian Williams as “some egghead theory dude” which made it clear they had never actually read Williams, because the insult is so far off base. To me a “theory dude” is someone attending graduate level comp studies who can’t speak without obscure jargon and name dropping, whose esoteric references and provocative ideas always center themselves by circling readers back to needing a thorough critical analysis. Kristian doesn’t do that; his plain-spoken prose and simple consistent conclusions are more like an antidote to academia. He condenses a mass of historical evidence and research, backs it up with direct personal experience, and diligently organizes it all to point at his constantly re-stated conclusions. If anything, Williams errs on the side of being so reasonable, well-organized and direct that he risks boring his readers with a passionless bounty of statistics and facts in a standardized argument format: thesis, evidence, conclusion, repeat. On page nine, Williams explicitly states the main argument, not only of this collection of essays, but of his larger work criticizing police: “..the primary function of the police is not law enforcement or public safety, but the preservation of existing inequality.” The rest of the book fleshes that assertion out and pounds home relentlessly. You might not agree with what Kristian has to say, and you might not like the way he says it, but unlike theory dudes, you will not have any question as to what he is saying. The best thing that distinguishes Kristian Williams from theory dudes is that he is writing for radicals about their enemies, rather than the other way around. This is not only because his prose is clear and readable, or because he’s not embedded in academia, but because his most theoretical work- the aforementioned COIN piece is mostly an examination and summary of reports put out by pro-state think tanks. One of Williams’ sources, a RAND report on counter-insurgency takes its title, War by Other Means, from Michel Foucault, author of Discipline and Punish, the bedrock of current critical academic thinking on police. I most appreciate Williams for wrenching this knowledge back from the language of experts and transforming it to something which can be applied to daily struggle and resistance. Williams also ventures into new ground, taking on difficult questions that confront those who oppose the police. In Part Four: Fighting Back, Williams examines the paradoxes of accountability and reform vs. resistance and abolition. How does someone who wants to see an absolute end to all cops ever respond to a particular moment of police violence? If you recognize that accountability and reform will only lend greater legitimacy to the police – that the more we work within the system the deeper the system entrenches itself in our lives – what do you do in the day-to-day struggle? Williams doesn’t try to create any strict answers to these questions, recognizing that each local struggle is different, but he does engage honestly with them and ends up offering a really solid set of questions that anyone struggling against the police ought to at least ask themselves. When I read Our Enemies in Blue years ago, I wished anarchists were organized enough to continuously update and expand this book, to bolster and develop the idea behind abolishing the police with lessons from current events and ongoing struggles. It turns out, at least one anarchist is. 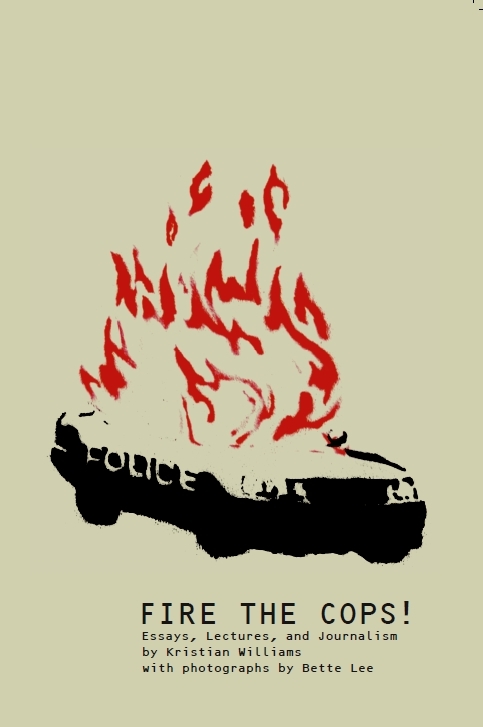 Williams has a new edition of Our Enemies in Blue coming in summer of 2015, and in the meantime, Fire the Cops! and Life During Wartime are here to broaden and deepen our understanding and scope of struggle. Ben is a co-founder of the anarchist theatre troupe Insurgent Theatre (insurgenttheatre.org) and a dedicated prison abolitionist. He focuses his prisoner support work on the survivors of the Lucasville Uprising (LucasvilleAmnesty.org), and prolific anarchist firebrand Sean Swain (SeanSwain.org).